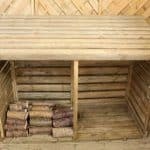 Wood Storage Sheds - Who Has The Best Wood Storage Sheds? 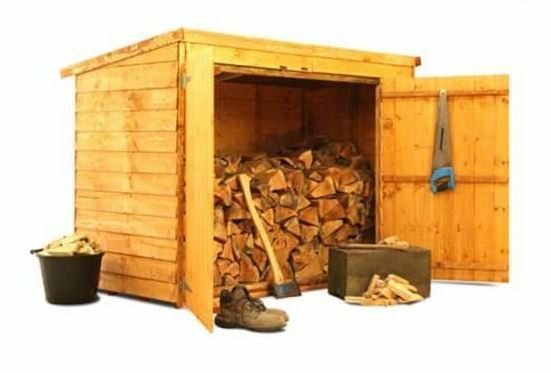 Wood storage sheds are an essential garden building for the increasing numbers of people who have log burning stoves, or those who use wood on an open fire. When you need lots of fuel you need a reliable place to store it, and a wood storage shed keeps it on optimal condition. 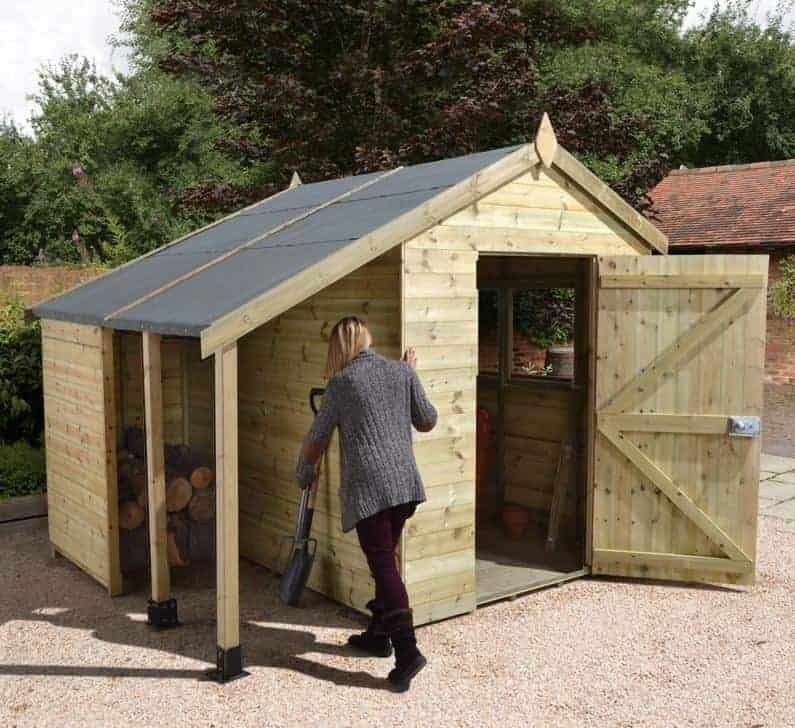 If you’re thinking of buying one, take a look at our handy WhatShed guide to the very best wood storage sheds that can be bought online in the UK today. Before we started, we had to define what constituted a wood storage shed. We then looked at their cost and value for money, visual appeal, storage capacity, durability, and what additional benefits they offered. There are two varieties of wood storage sheds that we’ve considered for our league table: Firstly are those which are predominantly larger sheds with an integral log and firewood storage area; for these sheds we imposes a maximum area of twelve foot by twelve foot, in order to put an emphasis on sheds rather than workshops. Secondly there are those which are similar to traditional log stores but with a more complex shed like design often accompanied by a door. This means that they have to provide a wood storage facility, but they also have to offer something extra as well to transform them from a garden accessory to a garden building in their own right. With this criteria in place, we were pleased to find ten high quality examples deserving of a place within our league table. With such diversity between these two kinds of building, selecting an overall winner was difficult. 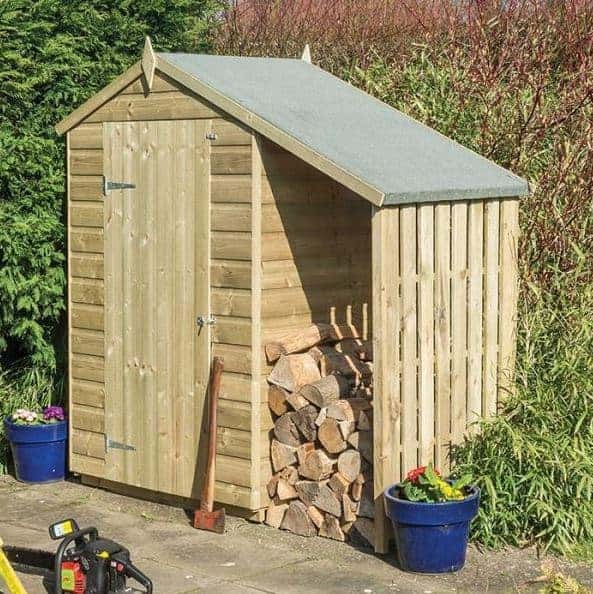 Congratulations go to the eight foot by six foot heavy duty shed with log store, which thanks to its great value for money, and excellent durability with a long warranty period, tops our list of the UK’s best wood storage sheds that can be bought online in the UK today. Whether you want storage sheds, workshops, or play houses, our WhatShed reviews can help you make an informed choice. Wood storage sheds come in two main forms – modestly sized shed like garden buildings that are designed primarily to hold firewood, and larger sheds or workshops with an integrated log store. This falls into the latter category, and represents a great garden shed as well as a great place to store your logs and firewood. It’s also a very durable building, thanks to the use of heavy duty tongue and groove cladding an an initial pressure treatment from the manufacturer that brings with it a 10 year guarantee against rot. With all that taken into consideration, we feel this represents excellent value at a price of under seven hundred pounds, and this takes it to the very top of our league table. These wood storage sheds have two distinct areas, covering a base area of eight foot by six foot, with most of that belonging to the main body of the shed itself. With two large windows on the side the interior is very well illuminated, creating a pleasant environment to spend time inside. The overhanging apex roof creates a three foot log store area, with an open frontage and covered sides, and it’s surprising just how much firewood it will hold. If you want a top quality mid sized shed with a wood storage facility as well, this is hard to beat. We move from the large and imposing to the small and subtle, but while this BillyOh wood storage shed is dramatically different to the shed above it in our league table, it has advantages of its very own. 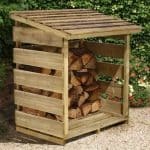 For starters, the three foot by four foot base area means that it won’t take up too much room in the garden, so it’s ideal for those who want a wood storage facility and nothing else and whose available lawn space is at a premium. Its main advantage, however, comes from its price tag of not much more than a hundred pounds, which we thing is superb value for money and which gains it the runner up spot against much larger opposition. We were pleased to find that the budget price of these wood storage sheds doesn’t mean that visual appeal has been sacrificed. The use of overlap cladding below a pent roof gives a rustic appearance that we found pleasing on the eye, and it should fit in well with traditionally styled gardens. There’s also an option to upgrade to tongue and groove cladding if preferred. 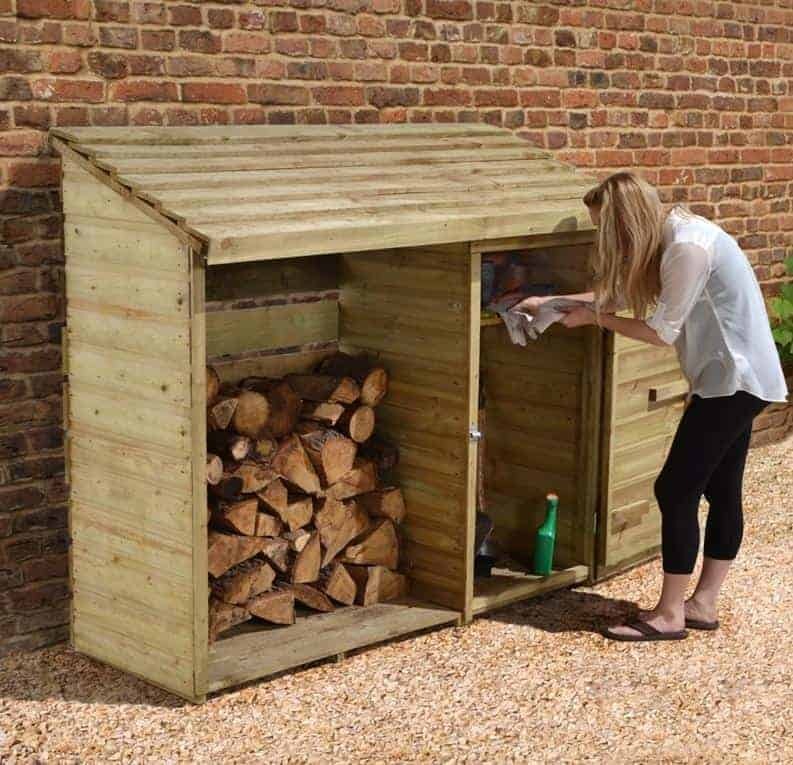 Although this compact shed has been designed with logs and firewood in mind, the fully closing doors also mean that it could be used for general garden storage purposes, thus increasing its versatility. The third of our top wood storage sheds also has a pent roof, but it’s a very different kind of garden building. Once more we have a shed that has both a storage shed main area and and adjacent firewood store. The three foot of storage space dedicated to this aspect of the building, underneath the projecting canopy of the roof, means that lots of wood and logs can be stored away, and the open front of this area encourages drying and so ensures that the wood will be in ideal condition for burning as fuel. 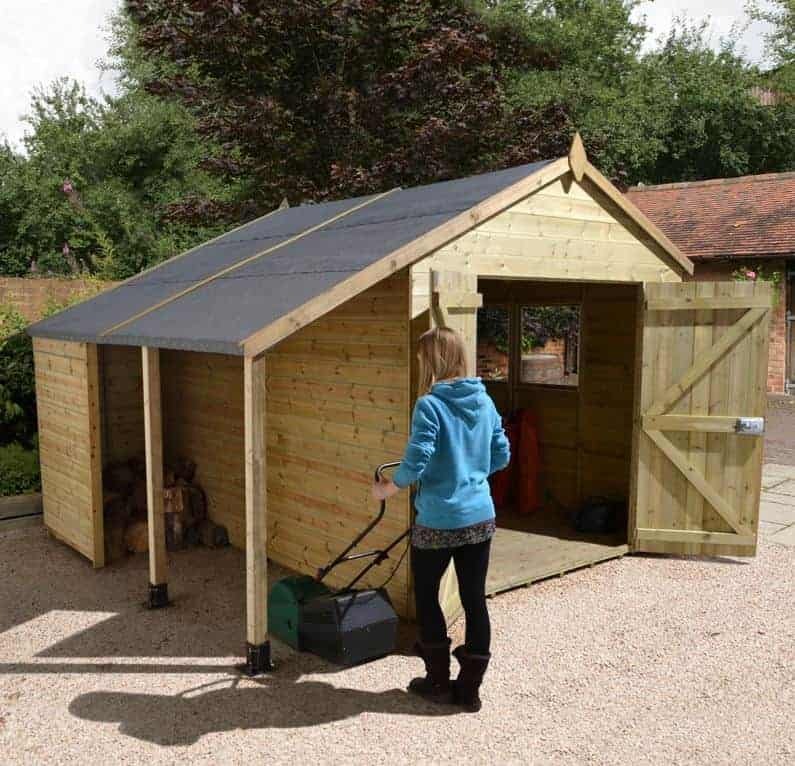 With a seven foot by five foot base area these wood storage sheds can also hold a good selection of garden tools and equipment as well, alongside a lawn mower or too. The pent roof has a peak height of 2.11m so there’s still lots of headroom available, and yet it can fit underneath overhanging branches where apex sheds may have a problem. We were pleased to find that a key operated rimlock is included as standard, so whatever you do keep inside is well protected from opportune thieves. It’s also more than adequately protected against the elements, thanks to its initial pressure treatment that brings with it a 15 year guarantee against rot. These compact wood storage sheds are among the most visually pleasing that we’ve reviewed, thanks to their traditional design and use of smooth planed tongue and groove timber. It even has diamond shaped finials at the front and back for an extra decorative touch. The main shed itself has a sentry box feel to it, and the wood storage area is supplied by a lean to. While given overhead cover by the apex roof, this has an open front and slatted sides, and so wood stored here will have lots of air circulating around it, which is always important for wood that’s going to be used on a stove or fire. Although these wood storage sheds are relatively small, we found that the 12mm thick cladding makes them feel strong and stable once assembled, and for a shed at this price we were pleasantly surprised to discover that the timbers had been pressure treated. This gives them long lasting protection against rot, as the manufacturer’s 15 year warranty shows. 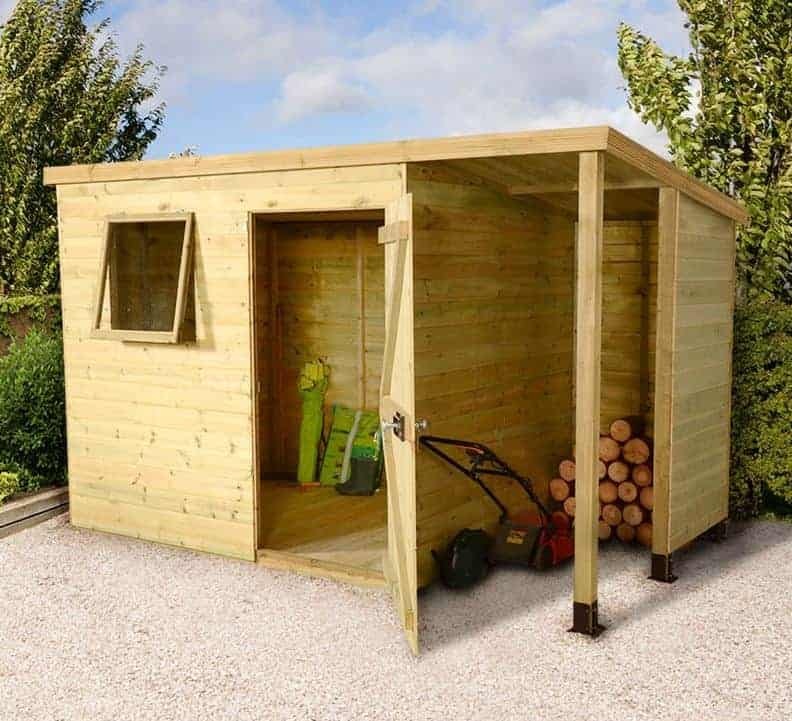 If you want a shed that’s ideal for small scale garden storage purposes and for storing firewood and logs as well, and are operating on a tight budget, then with an asking price of less than two hundred and fifty pounds this certainly deserves to be on your short list. 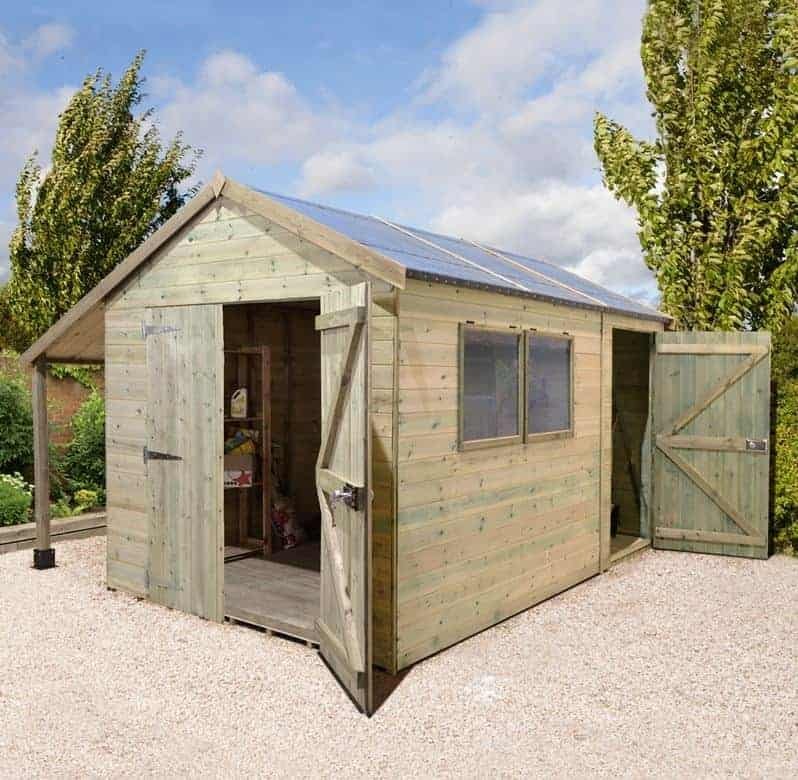 With base dimensions of approximately ten foot by six foot this provides a lot of room within the main shed area for use either for storage purposes or even as a small scale workshop. The two windows on the side panel mean that there’s lots of light inside, which is why we feel it would make a good environment to work in, or to use for a hobby such as carpentry. We were also impressed to find that the windows contained toughened glass, making them virtually unbreakable. That’s not only good news if you’re likely to have young children in or around the shed, it also makes it a more secure storage facility. This is also helped by the inclusion of a key operated lock, which is something that we always welcome. These well sized wood storage sheds have the log store area to the left, covered at the side and overhead, but open to the elements at the front for that all important ventilation. What impressed us most is the use of heavy duty 34 x 34mm framing and a heavy duty floor and roof as well. Once again a pressure treatment has been used, and this brings the reassurance of a 15 year guarantee. It’s certainly high quality, and at less than nine hundred pounds we feel this represents reasonable value as well. 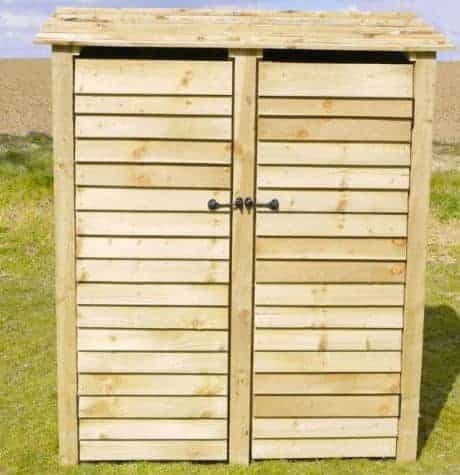 This is the largest of all the wood storage sheds to gain a place within our top ten league table, and yet it’s still not so large as to make it unsuitable for most medium sized gardens. Of course, with this extra size comes extra flexibility. We feel that this shed is big enough to dual purposes, meaning that one area of the building could be set aside for a storage area, whilst another section could be turned into an office or even a small workshop for either leisure of business purposes. When its size and durability is taken into account, especially as it also comes with a 15 year manufacturer’s guarantee, we feel this is decent value for money. We know, however, that the price tag will put it beyond the reach of some, and this has been taken into consideration when determining its rankings. We liked the double hinged doors at the front of these wood storage sheds, as they are both wider, at 1.52m, and taller, at 1.80m, than we usually see. This makes it very easy to transport large or bulky objects in and out, such as a bag full of logs for example. We talked about a dual purpose for this shed a moment ago, but of course it has another use as well, thanks to the wide wood storage areas to the side of the main shed itself. When we first saw this shed it looked like some of the others to be found in our league table, in that it’s large, sturdily built and has a wood storage area to the side of the main building, enclosed on three sides but open at the front. 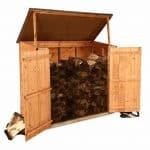 This boasts a feature that no other wood storage sheds do, however, and we found it a highly useful addition. The main body of the shed has a combination design; this means that whilst the shed has two toughened glass windows, it also has a secure storage area at the rear that can be accessed via it’s own door. This area has no windows, meaning that you can store items of value within it without anyone else being able to see they’re there. We were glad to see that both this area and the main double doors have a key operated lock, making this a very secure shed or workshop. We found lots more to like about these wood storage sheds too, including strong cladding and framing, unbreakable glazing, and a wide and tall main entranceway. Once again we were also impressed to find that an initial tanalisation process gives long lasting protection against rot and a 15 year guarantee. 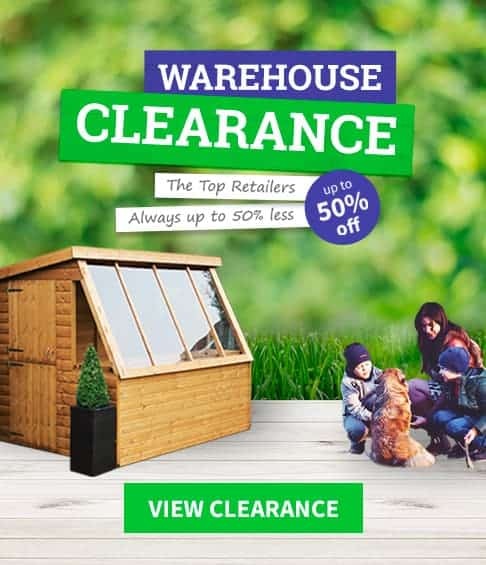 If you want a secure garden store with an integral wood store as well this is a wise choice, but it’s high price tag prevents it from reaching the top half of our league table. Despite their name, these wood storage sheds have a base area of 1.50 x 0.75m, or approximately five foot by two and a half feet, with six foot representing the peak height of the slightly pitched roof. Appearance wise this forms a stark contrast to many of the large sheds with integrated log stores that have featured earlier in this league table, with this having a much more modest design that’s primary function is the storage of wood and logs ready for burning as fuel. 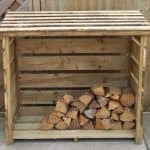 We feel this makes it a good choice for people who want a compact wood storage system, or maybe those who already have a larger shed in their garden. Rutland have obviously taken great care over the design of these wood storage sheds, despite them looking simplistic at first glance. The double doors allow easy access to every corner of the interior, making it easy to move logs in and out, and there’s a slight gap just underneath the roof that allows airflow to reach the wood inside. We also liked the fact that the shed is raised above the ground by joists, and that all the timbers have been pressure treated. This should make it very rot resistant, although we would like to have seen this reflected in the form of an extended warranty. These wooden storage sheds combine a storage shed with a wood storage area in a very different way to the large sheds that have featured earlier, but that doesn’t make it any less useful to those whose primary need is a weather protected area in which to store logs and firewood. That’s because priority is given to wood storage; the majority of the structure is a log store that’s open at the front, and with slatted roof floor and side to allow the maximum ventilation for firewood. Being made of rough sawn timber it has a rustic look which many will find pleasing on the eye, and that also means that it’s easier to paint or stain which can then make it look even more eye catching. The right hand side of these wood storage sheds is given over to a small side shed which is concealed behind a hinged door. 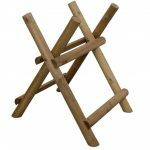 There’s just enough room here for a selection of gardening tools and implements, and we especially liked the inclusion of an upper shelf which is ideal for kindling as it means it will be given extra protection against rain. 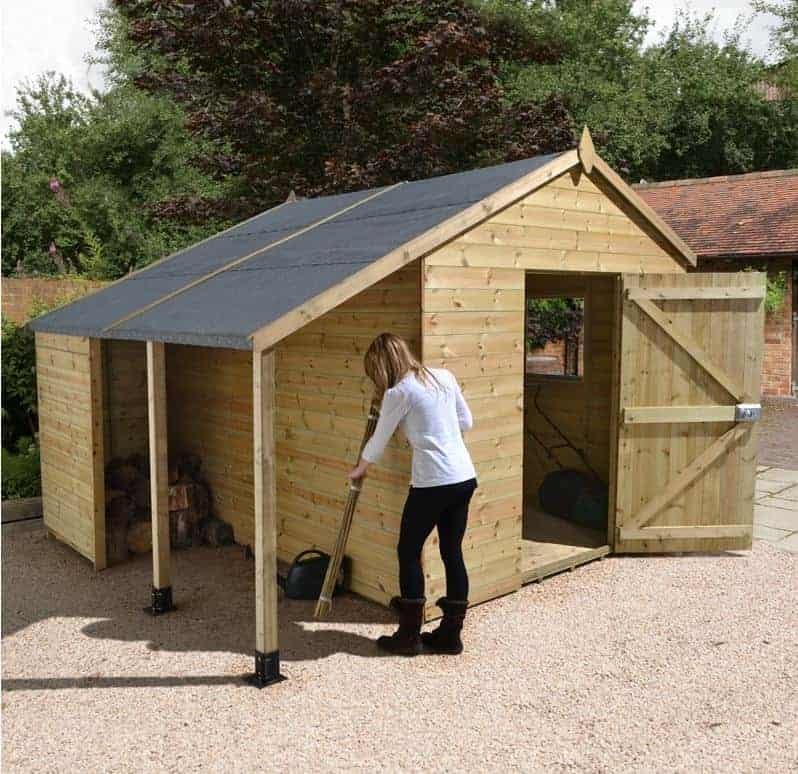 With a fifteen year warranty included as well, we think this provides excellent durability and value for money, and only the small scale shed area keeps it in the penultimate spot in our league table. We were also impressed with the use of 16mm thick spruce boards, which are thicker and stronger than we’ve found on any other wood storage shed. These eight foot by eight foot wood storage sheds from high end manufacturer BSW have a unique design among this league table in that they don’t have an opening door, but they do provide a modern twist on a traditional offset apex shed design, and therefore earn a place within our guide. As with other BSW garden buildings we’ve reviewed however they do come at a premium price, especially as they come with only a one year guarantee. 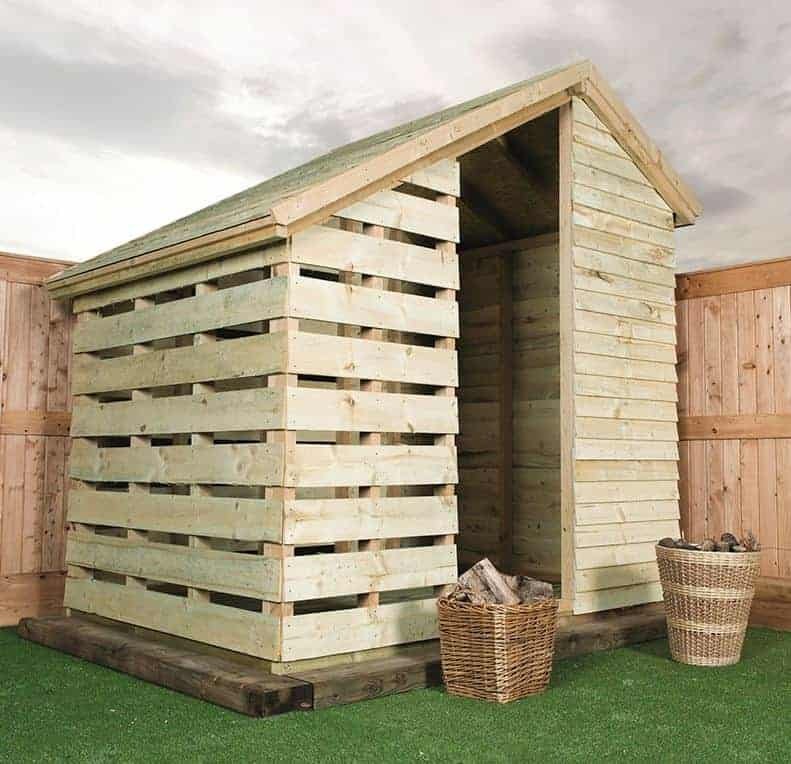 Nevertheless if you want a wood storage facility with an original appearance, and don’t mind paying nearly two thousand pounds for it, this is worthy of consideration. Instead of traditional door, these wood storage sheds have a wide opening. 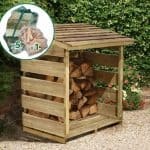 This provides even more ventilation, which is good news for the logs and firewood, and it also makes it very easy to manoeuvre wood in and out. We also liked the way that the front section of the shed is slatted to encourage ventilation, the rear section is fully boarded meaning that this area can be used for the storage of kindling, or other items that need to have added protection from the rain.